M+ Summer Camp is a youth-targeted initiative organised by M+. 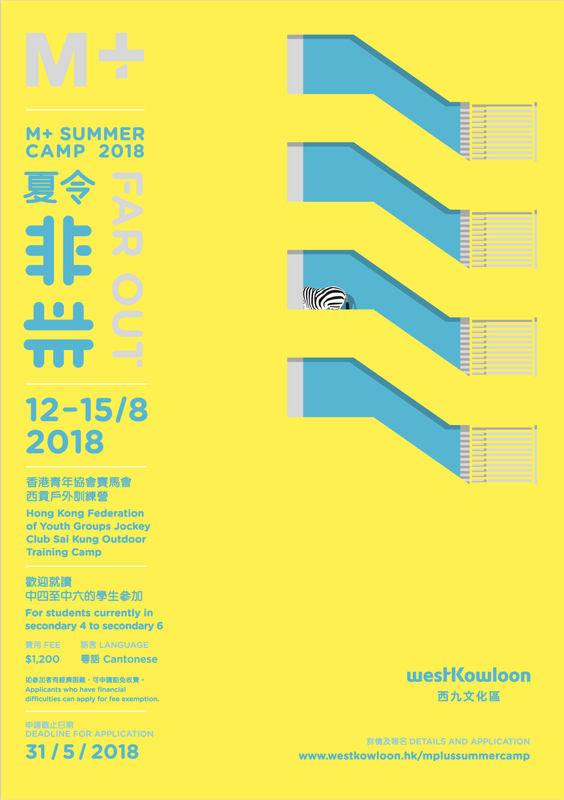 With the theme of ‘far out’, this year’s summer camp inspires young people to think freely when in search of future directions or in their exploration of their own sense of self, to break free from homogeneous lifestyles and values and to rethink the nature of creative practices and the possibilities of cross-disciplinary approaches. Can art making be a flight of imagination and be connected to real life at the same time? Can the sound in our surroundings become a work of art? Can architecture tell stories? Can social media platforms be a source of inspiration for ink painters? At this summer camp, practitioners in the fields of visual art, design, architecture, illustration, and moving image will challenge the common conceptions of creative practices, and let young people realise their creative thoughts through different experiments, merging whimsical endeavors with the everyday. In Chinese, the summer camp’s theme is feifei (非非), and the word fei (非) on its own suggests negation. The repetition of fei may at first glance suggest a double negative, but we hope to show that it does not always mean ‘yes’—just as the world is not one thing or the other, nor is it black or white. We can open up boundless possibilities, if we only break away from binary mindsets and see the world from different perspectives. Between black and white, there are countless shades of grey that can coalesce into a dynamic picture. 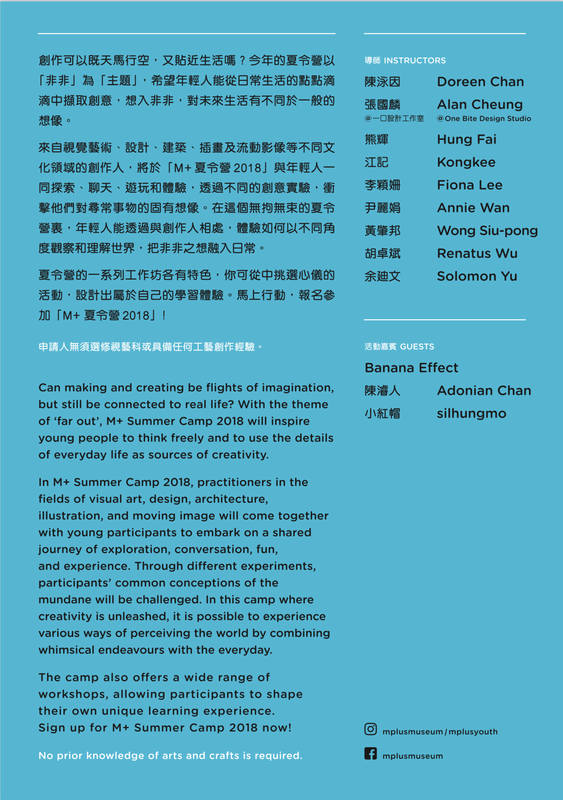 Just like the previous three summer camps, one hundred secondary-school students and arts practitioners will come together for a four-day camp this summer, on a shared journey of exploration, conversations, fun, and experience. The inspirations of one hundred people might not create immediate change, but over these four days of creative freedom, we hope young people can let their imaginations run free, to bring home different approaches and attitudes to being alive to the world and to see their wildest dreams become reality one day. Camp activities include indoor and outdoor workshops, talks, sharing sessions, and performances conducted in small groups or all together. Participants can choose workshops according to their interests and shape their own camp experience. M+ Summer Camp welcomes young people who are adventurous, open-minded, and curious about the world around them. No prior knowledge of arts and crafts is needed. A painted rock bleeds as living flesh across sheets of paper. A quivering line gives form to the nuances of meditative experience. The veiled light of an icon radiates through the near-instantaneous marks by a pilgrim’s hand. The group exhibition Luminous Shadows explores spirituality and transcendence in the sensory engagement with the material world. Each of the eight participating artists calls attention to the embodied experience of space and time, recuperating dimensions of art repressed by a modern aesthetics of detached contemplation. The work of art is here ritualized anew as a vehicle for salvation and awakening, a self-conscious theatrical illusion, a sensuous body of pleasure and pain, and an object of pious devotion and yearning. Organized as a series of shrine-like enclosures, Luminous Shadows is inspired by the cave as a primordial site of image-making and beholding. At once concrete and ethereal, the cave both heightens interiority and encourages dream-like wanderings into worlds beyond. It is an archetypal space of the Buddhist icon: Shakyamuni once miraculously imprinted his own “shadow image” in a cliff-side grotto. Radiant and reflective like a mirror from afar, this image would disappear into the blank rocky surface upon approach. Encompassing rubbing, wall painting, soundscape, and manipulations of perspective and light, the works in Luminous Shadows draw on the physical, sensorial, and conceptual ambiguities of the cave. 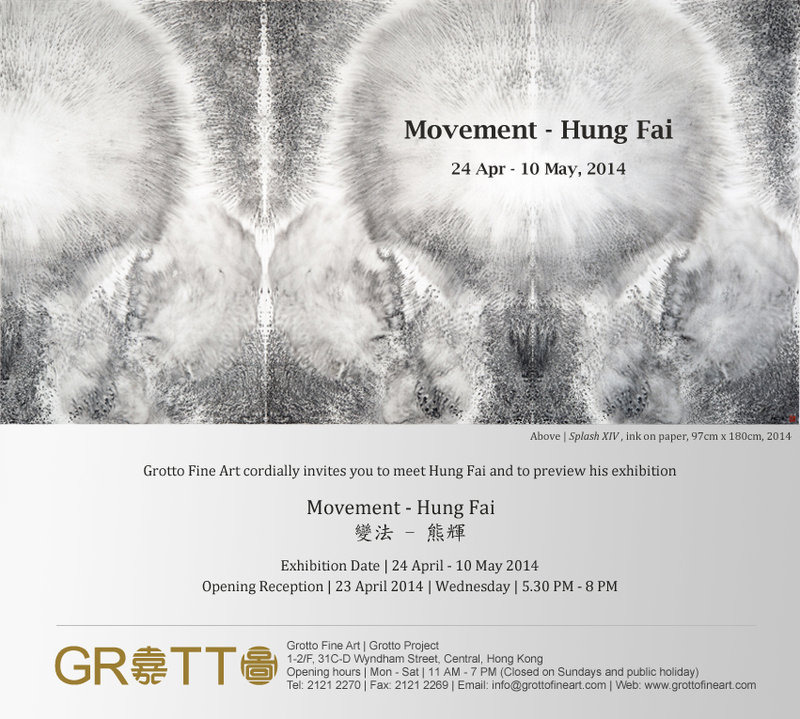 Hung Fai (b. 1988, Hong Kong) ritually enacts and dissolves the violence of patriarchal authority in his laborious stippling of a rock painted by his father. Li Jin (b. 1958, Tianjin) reproduces a Dunhuang mural depicting compassionate self-sacrifice, expressing his own piety through utmost faithfulness to its weathered surface and faded pigments. The pilgrim-painter Hung Keung (b. 1970, Kunming) captures his fleeting encounters with enshrined icons with ink-stained fingers. Here presented as an immersive installation, Michael Cherney’s (b. 1969, New York) photographs reconstruct auratic ruins of Buddhist grottos through the material artifacts of film and xuan paper. In Jennifer Ma’s (b. 1973, Beijing) installation, light and glass repeatedly coalesce into an illusionary landscape before dissolving in a reflective ink pool. Cindy Ng’s (b. 1966, Macau) video presents a theater of liquid traces, inviting and frustrating the desire for narrative and character. A shamanistic connoisseur of archaic stone and jade artifacts, Huang Zhiyang (b. 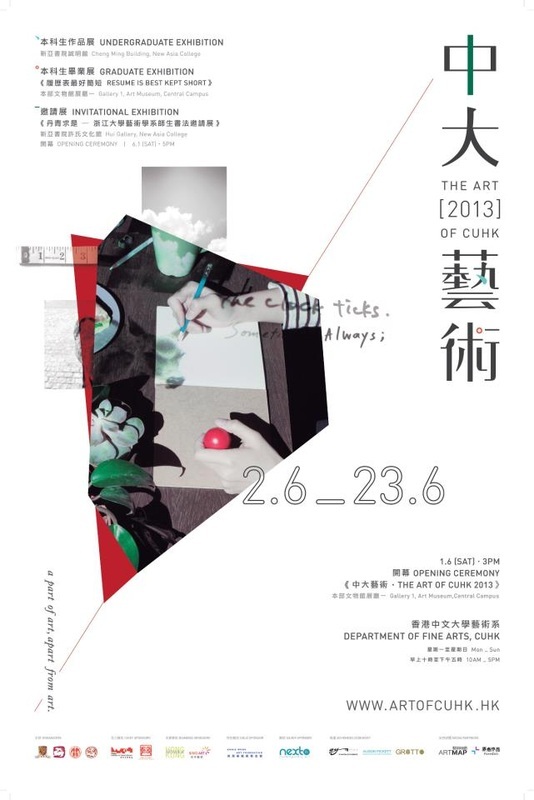 1965, Taipei) channels in painting and sculpture their mystical energies. Inspired by the landscape and religiosity of Tibet, Li Huasheng’s (b. 1944, Yibin, Sichuan) vast hand-drawn grids and lines oscillate between surface and depth, the infinite and the infinitesimal. 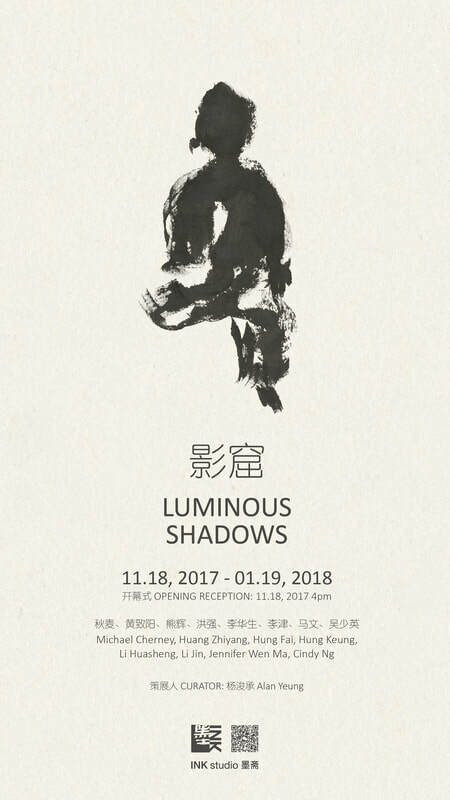 Accompanied by video and material documentation of the artists’ processes, Luminous Shadows presses on the question of agency and medium at the heart of the Shadow Cave lore. Does the power of images derive from material constitution, spatial and ritual context, the object of representation, or the devotion of the maker or beholder? Or is it precisely the indeterminacy between them? 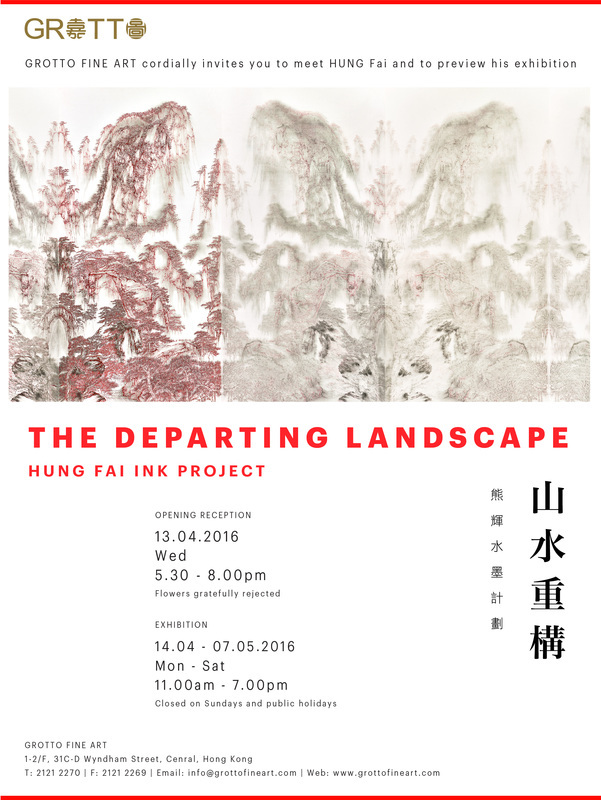 While ink art generally refers to visual works with lineage to ink painting and calligraphy in the Asian tradition, M+ is taking a more expansive view with The Weight of Lightness, which will present a transnational, interdisciplinary perspective on ink art from the 1960s to the present day. Throughout this period, artists have examined the practices and concepts of traditional ink art to develop new expressions and techniques influenced by their environments, personal experiences and artistic tendencies from outside their own cultures. These experimentations have resulted in varied applications and interpretations of the ink aesthetic, blossoming in different geographic locations and under different political, social and individual circumstances. 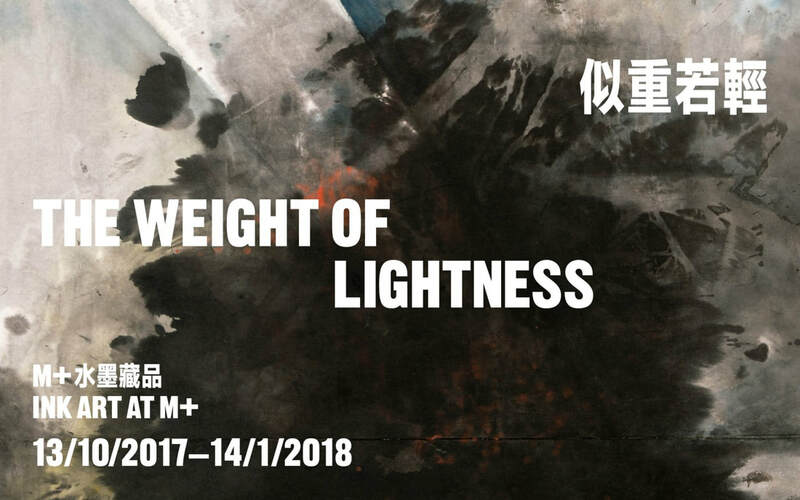 The Weight of Lightness explores how ink art is not only a medium, but also a crucial aesthetic in contemporary visual culture. Featuring works in various media including painting, calligraphy, installation, photography and moving image that demonstrate artists’ diverse explorations. 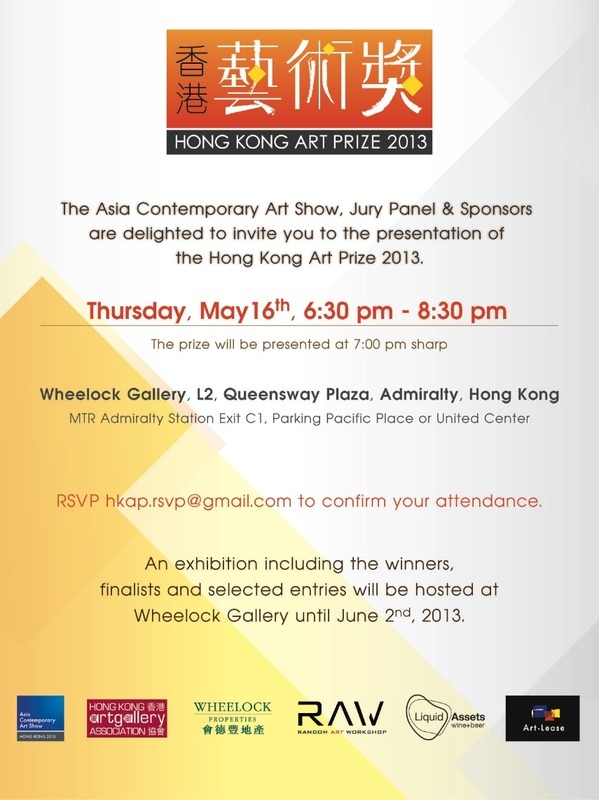 Nearly 60 works by 42 artists from more than 10 regions – representing Hong Kong, Mainland China, Taiwan, Japan, Korea, India, the US, Spain and more – will be on display. ‘Scripts, Symbols, Strokes’ showcases how artists channel their communicative impulses through writing, gesturing and mark-making in direct or implicit dialogue with the arts of calligraphy and drawing. ‘Desire for Landscape’ studies how landscape, arguably the most explored genre of the East Asian painting tradition, continues to inspire a wide range of artistic expressions. ‘Beyond Material’ focuses on the notions of transformation and transcendence by showing artistic investigations in the materiality of ink, water and paper, and by exploring the emotional and philosophical dimensions of ink beyond the physical world. Futuristic Ink projects perspectives of the future, and launches the visitor on a journey forwards through time. 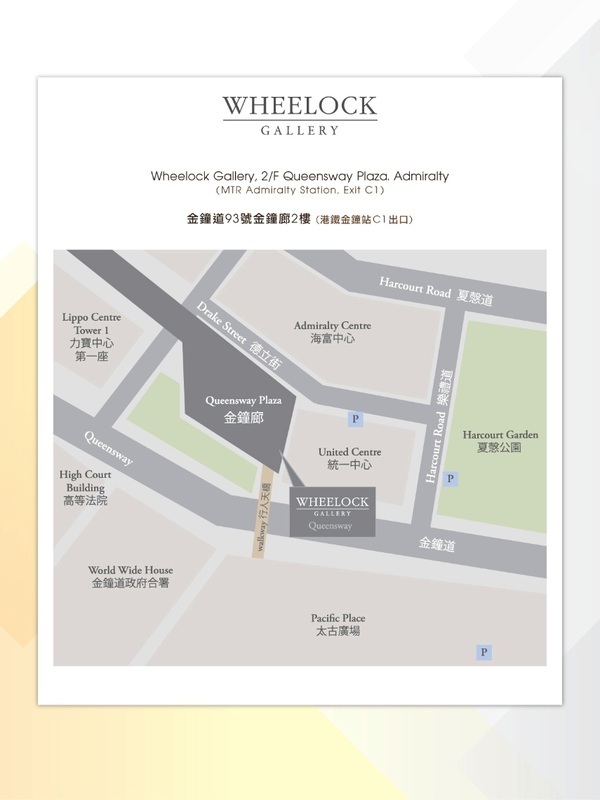 Hong Kong artists will explore new interpretations of our heritage, pioneering creative chapters in video, sculpture, machinery, horticulture (and paper!). 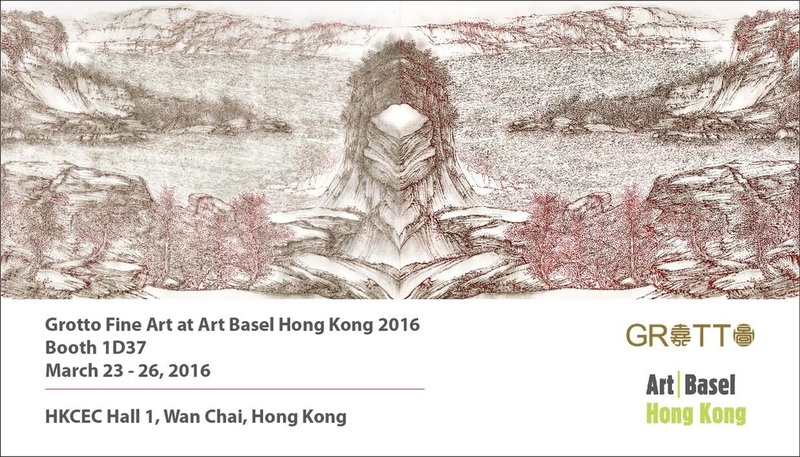 Presented by Asia Ink Research and co-curated by acclaimed multi-media artist Hung Keung and Henrietta Tsui-Leung, Futuristic Ink forms part of the 2016 Hong Kong Culture Festival. The show presents ten audacious, dynamic innovators whose charismatic output anticipates the future... and re-imagines the present. 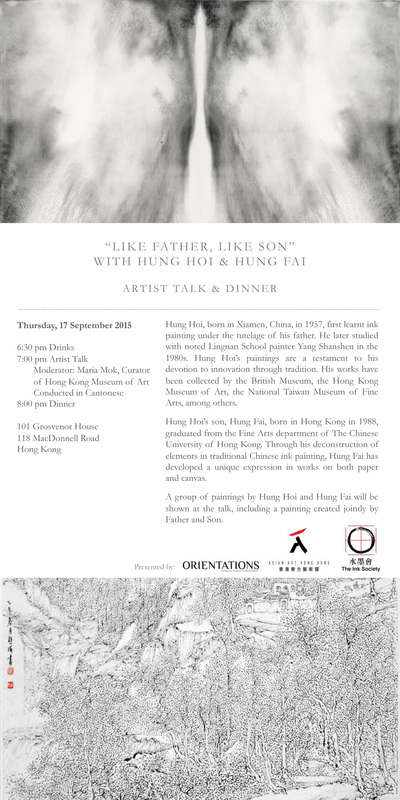 You are cordially invited to join us at the Liang Yi Museum for our opening celebration on Tuesday, October 18 from 6pm to 8pm. 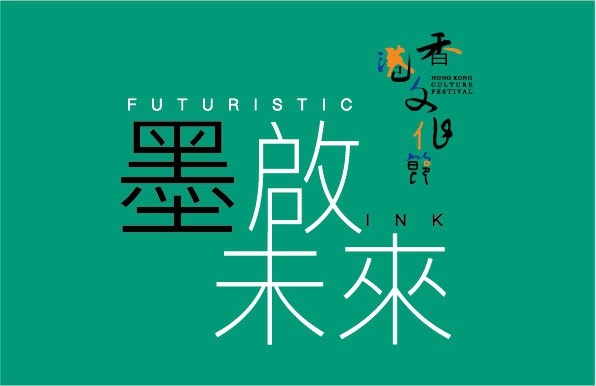 Futuristic Ink will run at the museum from Wednesday, October 19 to Saturday, October 22. 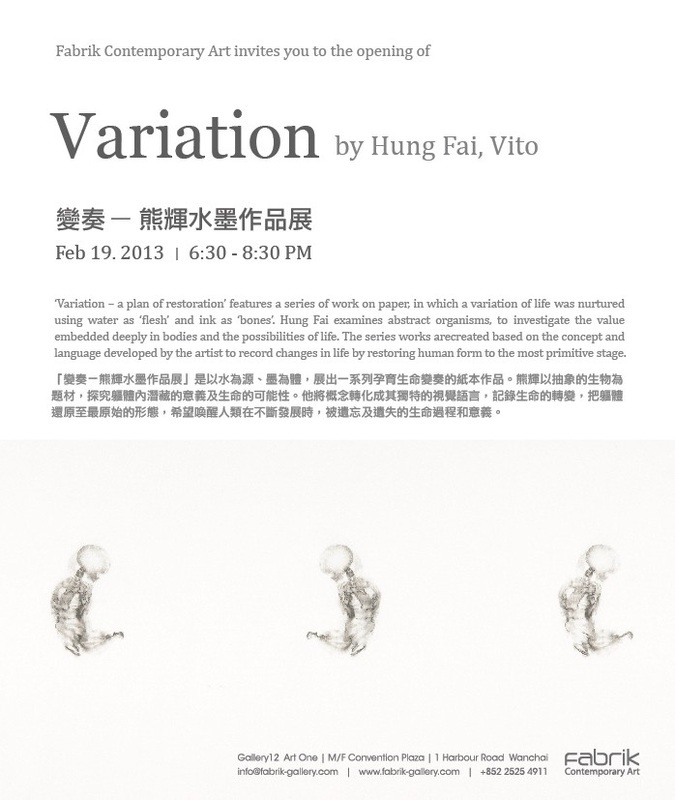 FEATURED ARTISTS | Benny Au, Chan Ka Kei, Halley Cheng, Ho Kwun Ting, Hung Fai, Hung Keung, Hanison Lau Hok Shing, Cindy Ng Sio Ieng, Tristan Ng Sum Chi and Wong Chung Yu. 9:30am-4:30pm (Monday to Friday); 9:30am-12:00noon (Saturdays); Closed (Sundays and Public Holidays). Endings and beginnings are always happening at the same time. mutate, evolve, or merge randomly, infinitely. Therefore, only following the path of variation can we decode the design of nature. emotions, languages, and scientific observations about the world.